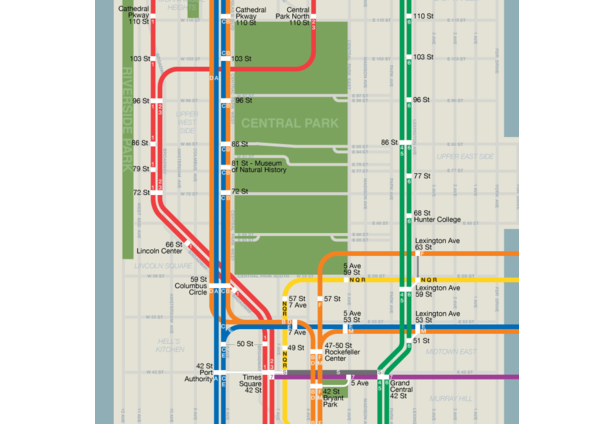 The New York City subway system is one of the oldest and most continuously used train systems in the world. Due to the complexity of the system and its esteem for round-the-clock service, maintenance work is often relegated to nights and weekends. We've all stood on the platform at 1AM wondering if our train is under construction or worrying whether an unexpected service change will affect our plans for the day. 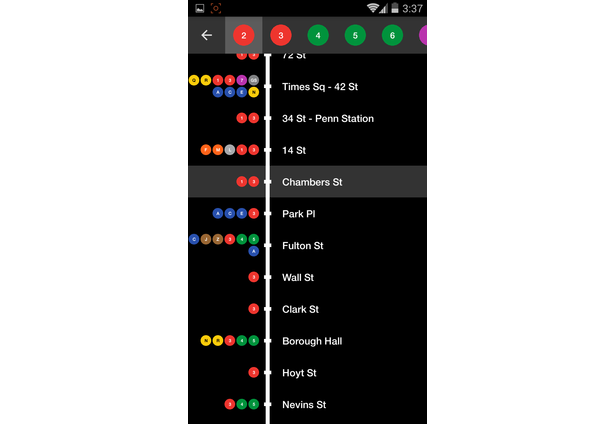 The Metropolitan Transit Authority and various mobile apps offer articulate announcements to warn travelers of these changes, but it's often difficult even for a seasoned New Yorker to translate this verbal information into our spatial understanding of directions. This can be particularly daunting for tourists and non-native speakers already unfamiliar with our system. 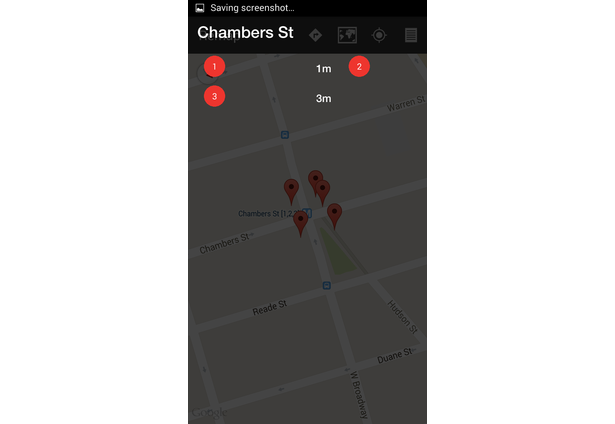 We believe that the best solution is to visually display the service changes on the map itself. 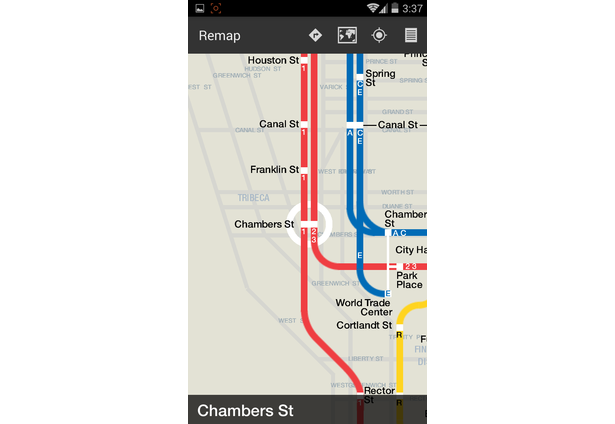 with Remap, we've created the first live map of the Manhattan subway system. 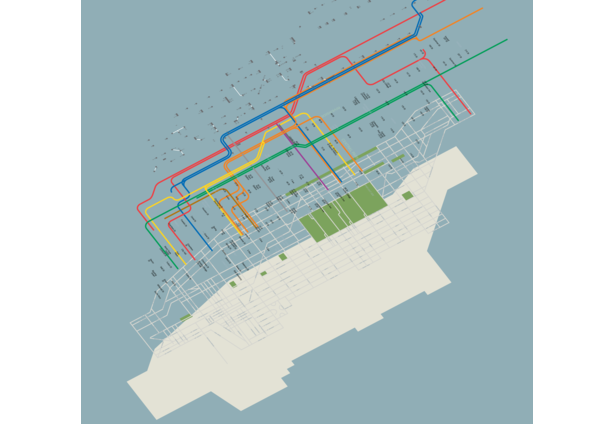 Each route is made of vector graphics based off of a carefully designed digital map so that it responds to service changes as they happen. 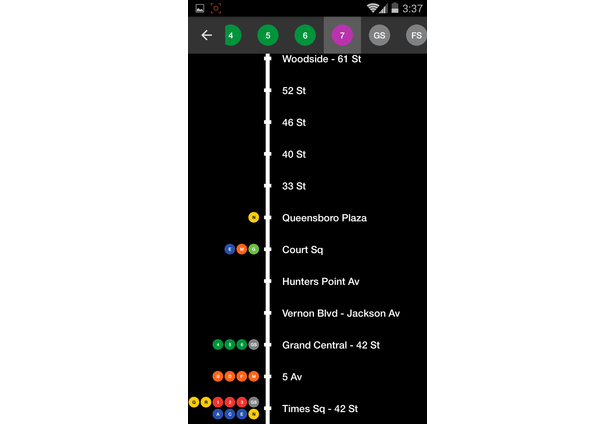 With MTA feeds, the map redraws itself at night, weekends and even the occasional unplanned train reroute. Unlike other transit apps, we decided not to use the official subway map, which was designed in the late '70s for printed display inside train cars. Because of this format, the official map is unable to take advantage of the technologies provided by the smartphone. While Google Maps is newer, its primary use case is navigating above-ground and does a poor job of showing subway routes and transfer spots because it's forced to have geospatial accuracy. In Remap, transfer points are clearly laid out and proportional to their actual walking distances. Available train transfers are adjacent to every station block. 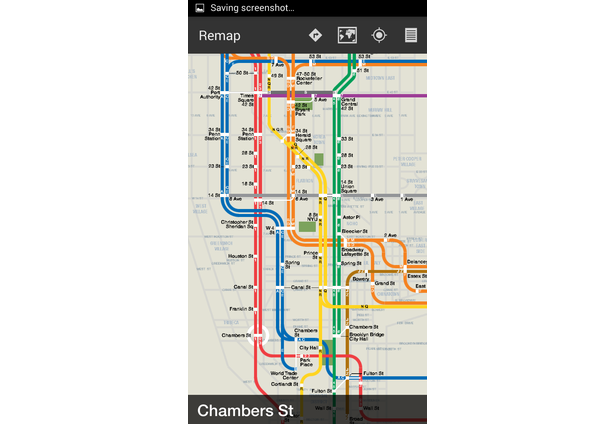 In addition to clear, stylized lines, remap is more geographically accurate than the current official subway map. 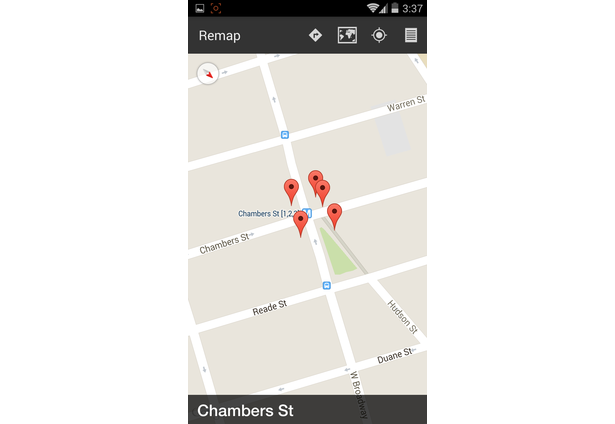 Most importantly, the map was designed specifically for the smartphone and it makes full use of its features. 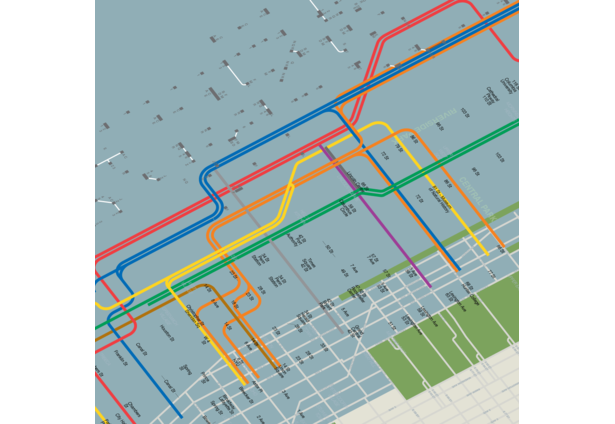 For example, fans of The London Underground map and Massimo Vignelli's iconic 1972 subway map, will appreciate the option to hide cross streets for a clear view of the train lines. 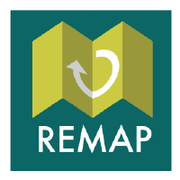 Remap is also host to several other features that further inform traingoers. Users can choose to update to their closest station by using your phone's built-in log of your latest GPS coordinate. We've built a REST service that provides a standardized version of the MTA's GTFS data to show accurate train times for the 1/2/3, 4/5/6, and L trains. There's also a line diagram and the option to switch to an above-ground map with the subway exits of each station marked. We've also been working with Bluetooth Low-Energy technology to implement a small mesh network into the app and plan to implement it later this month. The mesh network will enable users at the train platform to automatically exchange the latest subway timing and closure information with each other. Users who are entering a station will bring the latest train data to the mesh network and each neighboring phone that has remap will propagate this information to other phones. We believe that Remap will help visitors and native New Yorkers alike to better navigate the New York City subway system. We resolve to continue our work of making a dynamic map for the NYC subway more powerful while maintaining our core design principles of minimal and simple design. Comments for this submission are closed. View the software in sinoirish's portfolio to continue the conversation.